and you wouldn’t get a better result by having an epub/mobi hand-coded. However, if your book is more than chapters, sub-chapters, text, and a few images, maybe MS Word is not a good way to go. Sometimes books have special parts that need special handling, and MS Word just isn’t cut out for that. Here are some cases where I recommend using epub/mobi as a source file for conversion on Amazon/Smashwords instead of MS Word. My book has a lot of images that are important. They have to be big and visible. The best option for books with important images that need to be of better quality & visibility is an epub for Smash, and mobi for Amazon. Epub/mobi allow images to be set to adapt to screen size, while that option cannot be set through MS Word. See real examples of images in epub formatting. I have a lot of bullets and numbering. 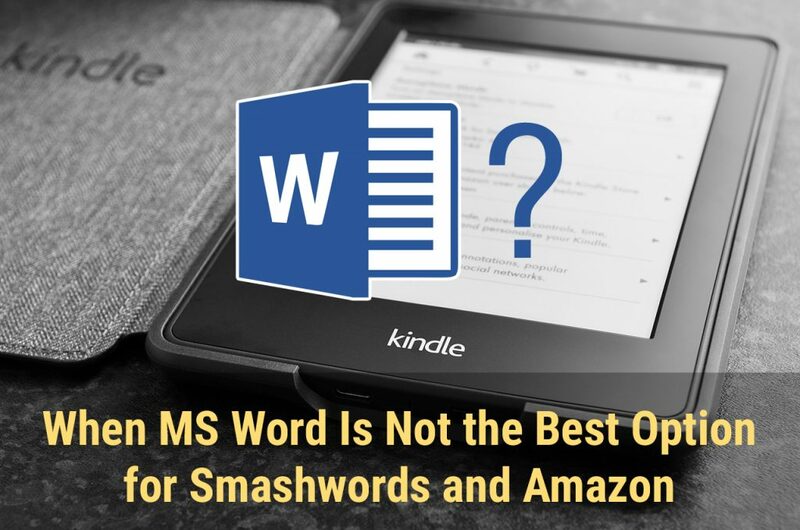 In about 98% of the cases, they won’t convert well through MS Word. By default, Smash rejects files with MS Word’s automatic bullets/numbering (not allowed; have to be converted into plain text). So, all bullet/number lists have to be either styled as plain text lists (no hanging indent), or you need to have an epub made. Amazon allows MS Word’s automatic bullets/numbering, but their conversion system doesn’t handle them well. There’s nothing you can do in MS Word to fix that situation. Although it might look okay in some previews of your book, it won’t look okay on most devices, especially smaller ones like smartphones. When you find out—it’ll be too late. If you have a lot of lists, especially multilayered ones, it’s best to go with hand-coded epub/mobi that have lists handled perfectly. But, if you have a list sporadically here or there, then you might benefit from MS Word. See real examples of bullets/numbering in epub formatting. I have tables that need to look good. Smash doesn’t allow tables inside the file. They have to be converted into images or text in both Word and epub. Images, on the other hand, cannot be too big in MS Word, so visibility might be an issue. Even though Smash doesn’t allow tables in epub, it is still a better choice, because tables can be made into images that adapt to screen size, and as such they will look okay. On Amazon, tables in MS Word look okay in most cases. When they are bigger, it’s better to have mobi hand-coded with tables set to adapt to screen size which cannot be done in MS Word. See real examples of tables in epub formatting. Reading the above text might push you to consider epub/mobi over MS Word even if your book doesn’t really need it. That’s why you should have in mind that epub & mobi are finished products that cannot be edited afterwards, and MS Word can. Editability of the file in self-publishing means a lot for all those subsequent changes you might need down the road.